Hi, today I have posted not 1, but 2 cards for Through the Purple Haze Challenge. I would like to say first of all, that free digis are available from our very generous sponsor, Crafts U Print. I didn't want to forget to mention that... very important to all scrappers... we do love freebies. LOL Lets get a look at the card I made with my digi. 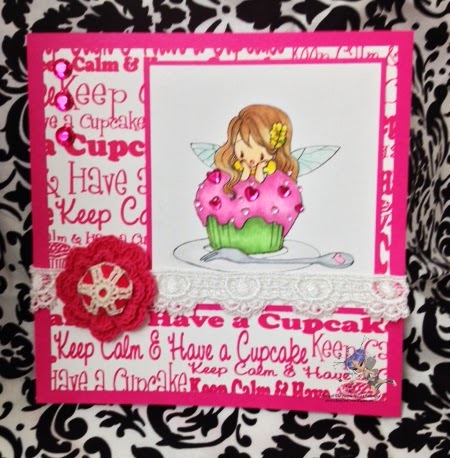 My image as I mentioned is from Crafts U Print and you need to visit their shop and see all the cuties they have and some really cool digital sets. And while you're there get your digi and join in the fun at Through the Purple Haze Challenge. Hope to see ya there!! Well, this is my 2nd card and I hope you have enjoyed your visit. Thanks for coming by and I hope to see you again real soon. I love your cupcake card and your "sprinkles". Very pretty card with pretty paper!